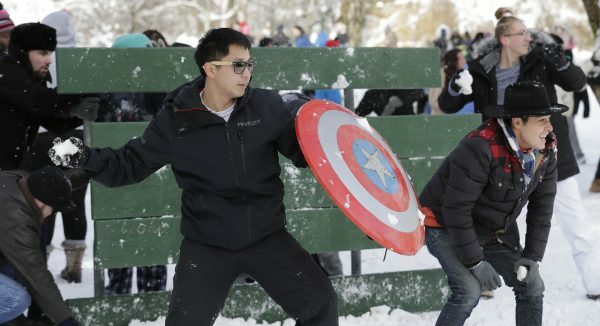 SEATTLE—Residents of the Pacific Northwest took to neighborhood hills with skis, sleds, and even just laundry baskets on Feb. 9 to celebrate an unusual dumping of snow in a region more accustomed to winter rain. Some areas received more than a foot of snow, and meteorologists said more is on the way early next week. Hundreds of flights were canceled in Seattle and Portland and heavy snow drifts closed major highways in eastern Washington. Around 50,000 people lost power. Residents cleared out grocery store shelves and left work early Friday afternoon, Feb. 8, as the storm arrived. 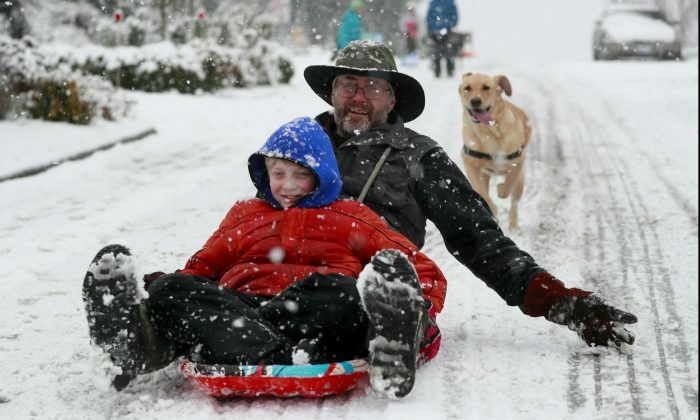 More than a foot of snow was recorded by Saturday morning, Feb. 9, on the Olympic Peninsula, in the nation’s latest bout of winter weather. In central Washington, blowing snow and drifts 3 to 4 feet deep forced the closure of U.S. 2 and Interstate 90. The Grant County Sheriff’s Office warned that snow drifts were blocking many roads. Airports in eastern Washington closed, and numerous car crashes were reported. The National Weather Service said additional snow could fall Feb. 9, and another storm was expected early next week. About 180 people spent the night at an emergency shelter set up at Seattle Center, with officials going out again on Feb. 9 to get other homeless residents to safety. Inslee declared a state of emergency. The state transportation department said crews had to clear several trees that had fallen across roads in the Tacoma area. In Portland, a tanker truck slid into a sport-utility vehicle on an interchange between Interstates 5 and 84 on Feb. 8, blocking the ramp for hours. Other parts of the country were also wrestling with difficult weather. Residents in Hawaii were bracing for coastal flooding amid extreme surf predictions. A California man died in rough waters off of Maui on Feb. 8, Hawaii News Now reported. In California, more than 120 visitors and staff members were rescued Feb. 7 after being trapped by up to 7 feet of snow in a Sierra Nevada resort for five days. Another winter storm was on its way to the region. Elsewhere, more than 148,000 customers lost power in Michigan following days of freezing rain. The Consumers Energy utility said power would be restored by late Feb. 8. In Washington, about 50,000 people lost power. 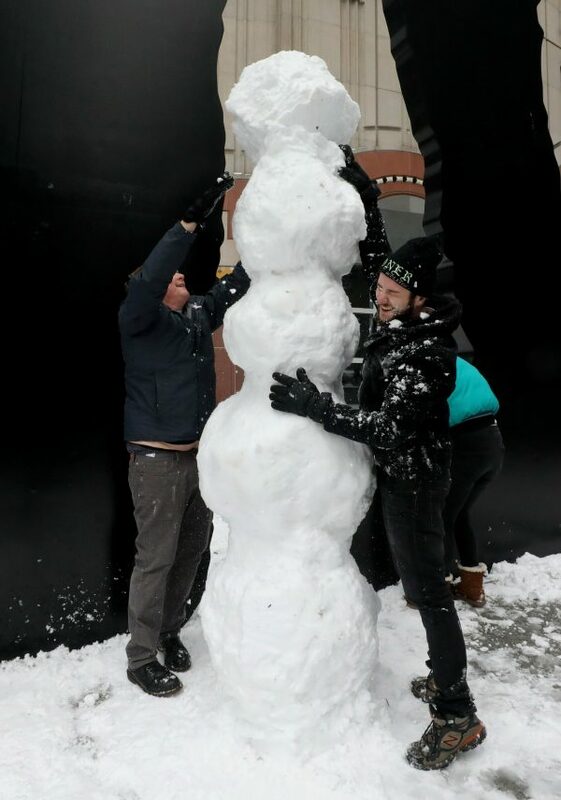 In Seattle, snowfall from Feb. 3 and 4 lingered into the week as below-freezing temperatures gripped the area. A 59-year-old man died Feb. 7 from exposure at a Seattle light rail station. Autumn Sang was at a packed grocery store in Tualatin, Oregon, on Feb. 8 stocking up for the coming storm for herself and her neighbor, who is disabled and doesn’t have a car. Sang said she had never seen the store so crowded. She grew up in southern Oregon, where snow is more common and wasn’t fazed by the forecast.